MacDailyNews Take: Hint: Apple Watch is going to sell like hotcakes! I thought Alibaba had a recent IPO. 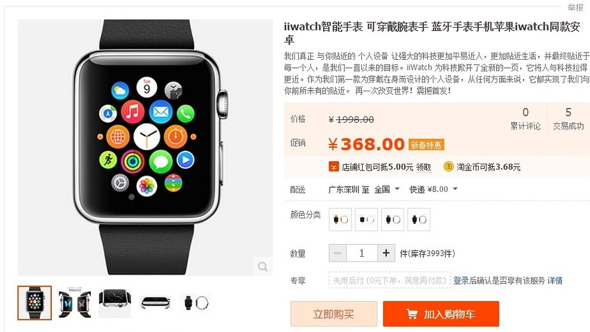 If so, can’t Apple file a lawsuit against Alibaba for allowing the fakes on their site? It’s buying a plate of chicken and not minding if it’s really cat, because the price is so good. Hungry again real soon, though. Can’t even stop it in the USA. (Thank you, Judge Lucy Koh!) How are we supposed to stop it in China? These are “knock offs” in appearance only. There is no chance the copiers can mimic the functionality, or even come close. That’s why they won’t even try. It’s mostly a “shell” with basic watch functions, like “fake” clear eyeglasses (that don’t do anything) for people who want to look smarter. Apple is not losing much; anyone who wants an Apple Watch for what it DOES will buy a real Apple Watch. Anyone who only wants to pretend to have an Apple Watch does not have an iPhone either, and they are not potential Apple Watch customers. China clearly loves AAPL products. It also loves gold, and with the highest-dollar products in the Apple Watch line — the Apple Watch Edition — lined with 18-karat gold and retailing for between $10,000 and $17,000, don’t be surprised if AAPL makes a fortune on the Watch in China. While China alone could help stoke another rally in AAPL stock, it isn’t the only overseas market investors should keep their eyes on. With pent-up demand in China and the willingness to tweak product prices at will, AAPL stock looks like a strong buy ahead of the Apple Watch launch on April 24. Free advertising for Apple. No one counterfeits a 3 dollar bill. Anyone who has money and brains buys the real thing. Even if it is partially functional and made by Slamdung in Korea, it cannot access the rest of the Apple ecosystem and will never take Apple share of the market. Again, free advertising. Get your REAL AppleWatch gold plated for $2k……….umkayyyy……. …Because communism kills the incentive to invent and innovate.